When out on the water having fun, you need your watercraft to have all the essentials and a few extras to make the most of it. With our selection of Sea Doo accessories, make sure you have all the important components and gear before you head out to the water. We offer one of the largest selections of Sea Doo accessories to ensure you get exactly what you need for your time on the water. With a focus on bringing you options of high quality to ensure satisfaction and peak performance, these Sea Doo accessories are the perfect way to add something extra to your model. One of the most important items for anyone spending time on a watercraft is a dry bag. This essential allows you to store important items such as your cell phone or wallet in a secure bag that will keep everything dry and secure. We offer several options for this necessary gear to help you get the right one. When you need items to make riding easier such as floorboard wedges, grip mats, or reboarding ladders, we have you covered. Whether looking for safety essentials such as a backup fuel caddy, whistle, or a fire extinguisher, or looking for something to add more fun like an audio speaker designed for this wet environment, we have it all in one easy to navigate location with our inventory of Sea Doo accessories. With an inventory that offers a diverse spectrum of solutions covering every area of your watercraft, it is easy and hassle-free to take things up a notch. We offer only high-quality products to ensure satisfaction with every purchase. Find the right solution for your model today and get back on the water with all the latest products! 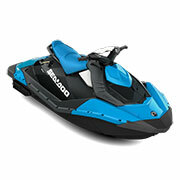 Here at Sea Doo Parts Nation, we are your source for all the best solutions for a range of models. If you have any questions while shopping with us, please reach out to our friendly staff for further assistance. We are always happy to help our customers!